I first started cosplaying because my parents got married. No really. My parents chose Halloween as their wedding day, and once I was old enough to realize the significance of that I made sure every Halloween we dressed up. It was a while before I sewed my own costumes, however, so my mom either helped me or we threw together something from our closet. 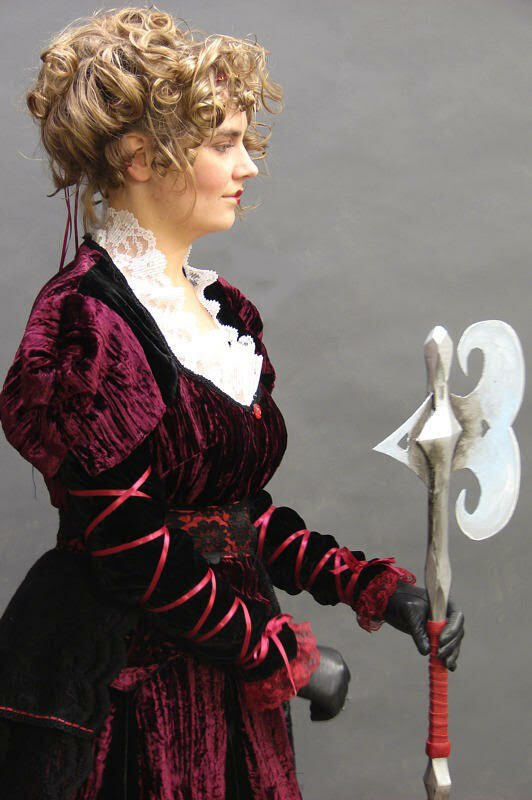 I first started seriously cosplaying in 2003, but those first costumes were firmly in the realm of elves and queens with flowing, big dresses. Lord of the Rings was top of my lists since I was raised on the books. Growing up rural and with a limited amount of spare cash, I had no way to afford a comic book habit, so I missed out on the wave of interesting titles that cropped up in the ‘90s. My first introduction to Hellboy was, therefore, through del Toro's movies. When I saw the trailer for the first film I knew I'd love it. I was an odd child and It fits into that weird niche of fantasy and horror I was starting to gravitate towards. After I saw it in 2004, I wanted to do a Hellboy themed cosplay, but the only two options that fit my skill set at the time were Liz and Elsa. I briefly considered making Elsa's red outfit from this scene. But wasn't comfortable even then basically cosplaying a Nazi. It wasn't until I got a hold of the comics that I found a character that I could click with: Dr. Kate Corrigan. I love Kate's interaction and character in Hellboy from the moment I read the Wolves of Saint August. She was smart. She wasn't Hellboy's love interest, but he clearly respected her. It was the first costume where I didn't sew large amounts of my outfit. I raided my closet for belt buckles and pouches. I found a leather jacket for super cheap off Etsy. I bought patches. I felt like I was cheating honestly, but it was still fun trying to bring a character that has a very unique style to life in the real world. I chose one of her heavy coat casual looks, even though perhaps one of her military field outfits would have been more identifiable. Strangely, it was also a turning point in my cosplay. I threw Kate together and then posted photos on deviantART and forgot about it. About a year later I stumbled on a Tumblr blog that had re-posted one of my Kate photos. It had almost a hundred reblogs, and I was surprised by some of the enthusiastic comments about the character. I was actually kind of embarrassed because I hadn't realized how big the Mignolaverse Community was at that point. I had cosplayed Éowyn at the height of the Lord of the Rings craze, but with so many other, better cosplayers, it was hard to even to stand out. But here, with Kate, and my “bought and found” costume, I found a small group of people, strangers, practically squeeing that someone had bothered to bring this slightly obscure character to life. I updated Kate and wore the outfit to my first Dragon Con in 2015. A total of five people knew I was B.P.R.D. agent (most thought I was something from Resident Evil or Marvel) and only one knew it was Kate. It was still fun, and I obviously made those five people happy. I ran into one person three times and each time they shouted “B.P.R.D. !” Two years later I saw a post on Facebook asking if anyone wanted to do a Hellboy themed photo shoot at Dragon Con. There were maybe four people who showed up. It was small but it's amazing how much fun it was to just hang out with other fans. I was inspired to start the group Hellboy Universe (formally “Hellboy and B.P.R.D. Cosplay and Costuming” before it was decided that name was too much of a mouthful) after that event. That's where I met fellow cosplayer Joshua Thomas Craig, who is one of the few Rasputin cosplayers I'm aware of. Recently, he and I co-founded Hellboy Universe. I realized that, while the Hellboy cosplay community was very passionate, it was scattered across the landscape of Marvel and DC superheroes, which made it very very hard to stand out and connect with others who were doing Hellboy/B.P.R.D. costumes. Although Big Red himself is by far the most popular costume out there, I do hope to inspire and connect other cosplayers looking to cosplay a character from the Mignolaverse, no matter how obscure it is. Bohemian lady, Jill of all trades, tinker, dreamer, lover of music and the strange. is probably a hobbit. Probably. Currently hiding in the middle of nowhere with her twin (not sure which is the good or evil twin) Preferred if her vampires didn't sparkle, and her graveyards were unmowed.